I'm back to the fitness thing! This is just an FYI. I'm back to doing the fitness thing with a #GeekFit #DadFit theme. If you have a second, you could click on the widget over there to subscribe. It's a little all over the place but I'm just having fun with it for now. I'm trying to figure out how to be healthier without trying too hard so I'll be posting things that I learn about healthy eating, mindfulness, and exercise (there'll be some Silver Surfer stuff, and toys too!). I've been playing around with my social media accounts for a while now. I've changed my Facebook page and my Instagram to have something about the Silver Surfer in the title. So, I think that all of this begs the question, "what the heck am I doing?" The most honest answer to this is--I don't really know. For the most part, I'm just having fun online. 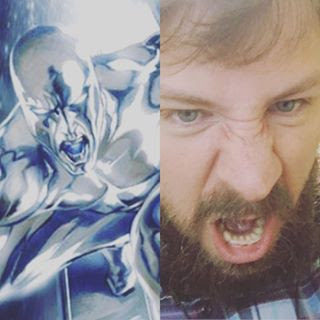 For some reason, I was walking across the parking lot at work and I decided that I should be uploading Silver Surfer themed YouTube videos because then, of course, Marvel would have to cast me as the Silver Surfer when he is inevitably integrated into the Marvel Cinematic Universe(MCU). This made sense in some long formant branch of my psyche; this was probably the part of my mind that I left behind when I was playing the lead in my high school play and singing Phantom of the Opera in my family room as a teenager. I'm still here and writing. I've just started running into the same old stumbling blocks that I always do when I start a blog. After I was starting to make some progress I became really insecure about the stuff that I was writing and why did I need a blog anyways. It's possible that I don't have the mindset that would give me something to post to a blog all the time. I guess that's really why I started this one up again though. I just keep putting so much pressure on anything that I write that it knocks me down to not writing anything. I think that I am going to keep posting on here. Pushing through the many layers of self doubt and anxiety that keep me from writing on a regular basis and so that this isn't just some solely therapeutic thing for me I'll try to post a link or a piece of generally helpful information in case someone accidentally stumbles across this blog. I'm really just trying to work out for 30 minutes per day for five days a week along with an increase in the amount of broccoli and other vegetables in my diet. Like everyone, I've been hearing about the benefits of 30 minutes of "strenuous" exercise per day or five days a week or three times per week for as long as I can remember. But other than, those treadmill or Bowflex commercials, I didn't hear any plans on how to work out for 30 minutes. So, like many, this lead me to running a lot; because that was something that you could time easily. Whenever I did go to the gym, it was inconsistent and I would usually end up moving from machine to machine for 45 - 90 minutes.